Bages is a pretty little touristy village on the etang (salt-water bay) south of the city of Narbonne. There's a fantastic view of the Narbonne cathedral several kilometers across the etang from a lookout point at the top of the village near the village's little church. During high season, Bages is a hopping place but at other times it's a quiet, peaceful town with pretty facades to stroll past and a fine restaurant or two in which to pass a relaxed luncheon. One of those restaurants is Les Jardins de Bages just across from the cafe Les Beaux Artes, another fine choice, by the way. We sat outside under the shade of a tree heavy with ripening olives. We had no reservations for our Sunday luncheon but it was the very end August, the high season was virtually finished, so there was no problem being seated. Service was crisp, timely, and helpful. There were four menus, starting at 18 euros for your choice of two plates (starter, main, or dessert) and going up from there. Seafood was featured as was to be expected so near the Med. My three table mates started with the fish soup. Not as hearty and thick as some but still tasty and satisfactory. I had a quiche with goat cheese melted atop and a bit of a side salad. All good. For our mains, two tajines with chicken and one with seafood - served hot in their clay dishes. I had marinated chicken with a bit of ratatouille and a potato mash on the side. Again all good, well-portioned fare. One cheese plate at the finish had a nice assortment. My one scoop of strawberry ice cream (all out of chocolate) had iced up a bit, so not the freshest best. 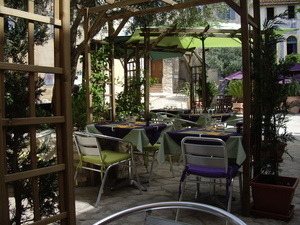 With a bottle of local rose, the total tab for lunch for four came to 90 euros. That's right in line given that the food was good and that Bages is clearly a tourist village that can charge tourist prices.With that in mind, Les Jardins de Bages is a good choice for a lazy lunch in the shade of an olive tree. A bottle of rose at 90 euros....no ! Looks a nice place. That's the full price for lunch for four, Nicola. Not all that bad. I'll edit to make it clearer.